WASHINGTON — I’m about to enter a world of cars and small crossovers that now offer more fuel efficient plug-in hybrid models. These are good for people that want to dip their toe in the electrified world but don’t want to dive in all the way. You get to combine the electric motor and a small battery pack with a shorter electric range, and then a normal gas engine that takes over when you run out of juice. The first model up is the MINI Cooper S E Countryman ALL4; the name is bigger than the subcompact crossover is. The E letter in the name stands for electric and is the biggest change with this model. The normal gas engine is good for 134hp, nothing to get crazy about. But the electric motor is good for another 87hp so suddenly this little crossover jumps to 221hp. That’s more power than the sportier Countryman S model. Going green doesn’t always mean going slow. The E Countryman is a peppy little Ute that’s very fun to drive and it handles great for a little crossover. I ran mostly on electric power when driving gingerly and the car is good for 12 miles before the gas engine need to kick in. In the cold winter expect to see less. Stop-and-go traffic can help by sending some power back to the batteries when you hit the brakes. Fuel economy is good when you combine the battery and gas together; I managed 54 mpg in a week of driving. No place to charge? Expect 27 mpg running on premium fuel — not shabby with AWD. The E Countryman doesn’t look much different than the normal MINI Countryman models until you really look closely. The first clue is up front where the S emblem is in yellow and not the usual red. Checkout the left front fender and you see a small yellow E door that houses the plug-in port. That yellow E emblem is also on the rear hatch and about the only thing that indicates that this a Plug-in hybrid. This MINI is the largest model they make, and it’s where many manufacturers start with their smaller vehicles. The MINI Countryman has all the styling cues that crossover buyers are looking for. The ride height is raised so it doesn’t look like a wagon and the blacked-out lower body moldings give it a rough-and-tumble look. Roof rails add extra storage space. This MINI is the most mainstream model with a normal rear hatch and not the odd but cool split hatch on some other MINI models. When you hop inside the pricey $40,000 MINI Cooper S E Countryman you’re greeted with a high-end interior. Leather power operated sport seats offer good support for those up front; the seat bottom extender is helpful for people with long legs to find comfort. But those seats can be tight for larger people so you want to spend time inside to see if it fits you. For MINI, there is nothing small about the headroom and adequate legroom for those in the back. The cargo area is smaller than some of its competition but still usable. Lots of glass adds to and airy feel and it seems bigger than its smaller size suggests. Big round gauge pods for the driver’s dash offer a cool visual reference and neat styling feature. MINI uses a toggle switch for the ignition which I forgot about when I first had the car delivered, not sure how I missed it. 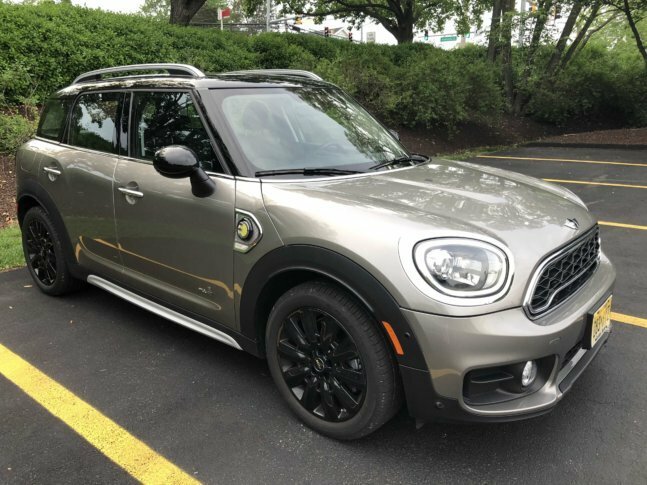 The new MINI Cooper S E Countryman ALL4 is the little premium crossover that offers something different. With a Plug-in hybrid, enjoy the benefits of a gas-saving electric motor for short distances. The MINI attitude still remains with a fun-to-drive crossover that is more powerful as a gas-saving hybrid.